• A recent study shows that 79% of people between ages 18 to 44 have their cellphones within them almost all the time, with only 2 hours of the day spent without their phone in their hand. 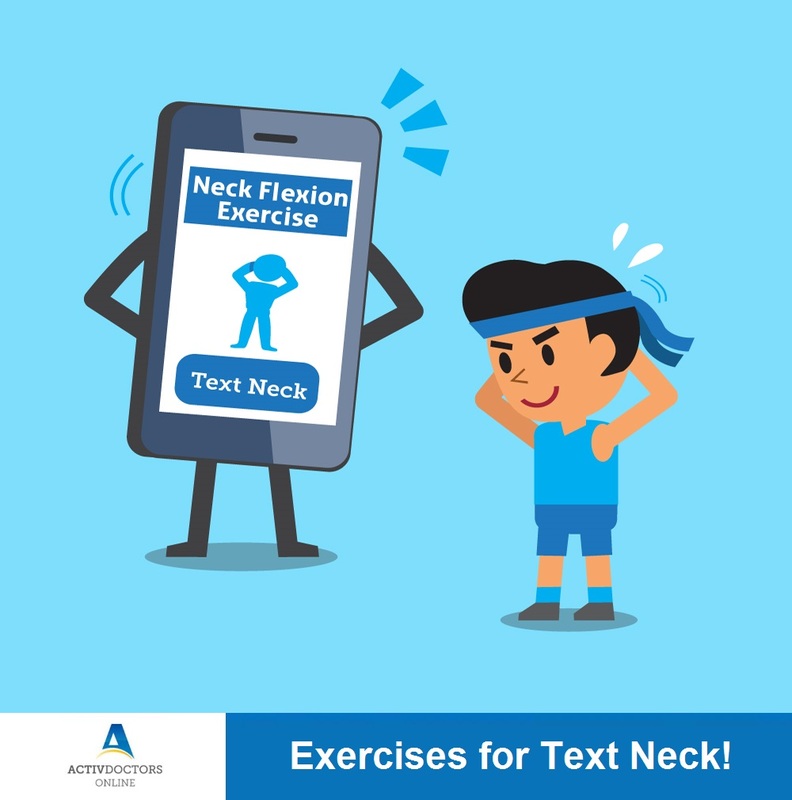 • Text Neck is a term used to describe neck pain and stiffness from looking down at your cellphone or tablet too frequently and for too long. • Text Neck most commonly causes neck pain and soreness, leading to acute or chronic neck and upper back pain, leading to upper back muscle spasms. • Studies show that text neck may possibly lead to early onset of arthritis of the neck. Today mobile phones are an integral part of our lives. However, looking down by dropping your head forward can change the natural structure of your neck. Widespread overuse of mobile phones results in a harmful condition called ‘Text Neck’. Guided Exercises and Rehab for Text Neck and other neck related postural issues go a long way in preventing recurrence of pain and discomfort. • Hold your phone/device at eye level, as much as possible. • Take frequent breaks – follow the 20-20 rule. • Prevent looking down, with your head bent for extended periods throughout the day. • Cervical Flexion – as the name indicates, Cervical Flexion involves sitting straight and gently moving your neck forward until a slight tug or stretch is felt in the back of your neck and returning back to the neutral position. • Cervical Side Flexion – Sit straight in a chair with your back supported with your neck in the neutral position and gently move your neck from side to side. • Cervical Rotation – Sit straight in a chair with your neck in the neutral position and gently rotate your neck to the left and to the right, as-if, looking over your shoulder. • Chin Tucks – Chin Tucks play in important role in giving you immediate relief from neck strains. Sit straight in a chair with your neck in the neutral position and bring your chin towards the neck, hold for a few seconds, and return to the neutral position. Neck Exercises as simple as these help increase blood circulation and relieve stiffness in the muscles around the neck, thereby, making you feel relaxed and ready to go.